Customizing your categorization system(s), particularly differentiating (i.e. breaking down) parent-codes or aggregating codes. the Overview of Coded Segments. The Smart Coding Tool will open immediately after you click on the icon. The table window is divided into two display areas. A reduced code system is displayed in the left area. 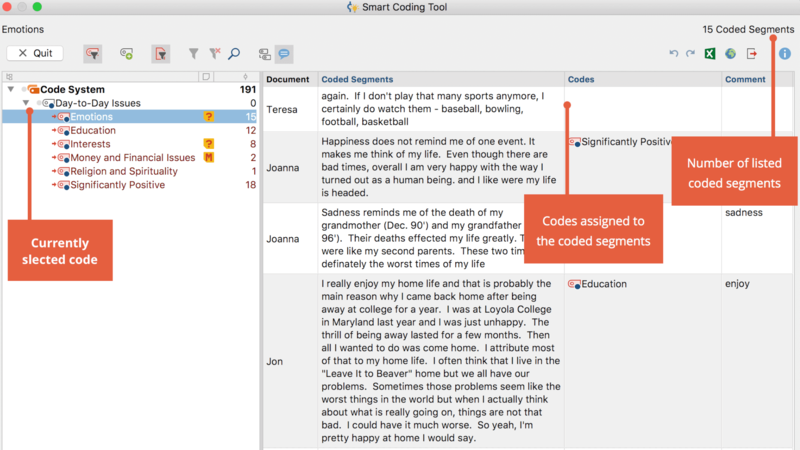 When you open the Smart Coding Tool, only the codes assigned to the compiled coded segments will be displayed in the code system. So that the hierarchical structure can be retained, sometimes non-activated parent codes are also displayed. The number at the end of a code row in the system indicates how often the code appeared in the selected documents. In the right area, the coded segments are listed in a table. The segments whose code is selected in the hierarchical list on the left and highlighted in blue will always be shown here. The code that is currently selected is displayed in the upper left corner. At the top right, you can see how many coded segments (from how many documents) are displayed in the table, that is, how many rows the table contains. When the Smart Coding Tool is opened, only the documents from which the compiled coded segments originated will be activated. Only their coded segments are displayed. Codes – The list of codes assigned in the area of the displayed coded segment. It doesn’t matter whether the code has only been assigned to one character of the segment, the entire segment, or even beyond the boundaries of the segment. Only the codes that are visible on the left in the code system are listed. So that the code name is not listed repeatedly in the column when a code is broken down into its subcodes, the parent code of the displayed coded segment is not displayed. Comments – A text field that can be freely edited (max. 255 characters) to add comments to coded segments. Like all MAXQDA table widows, the individual areas can be adjusted: the columns can be adjusted in width and position with the mouse, or hidden with a right-click on a column heading. A click on the heading sorts the column in ascending order, another click in descending order. Please note: All other MAXQDA functions are locked while the Smart Coding Tool is open. Only activated codes – restricts the display of the code system to the activated codes only. 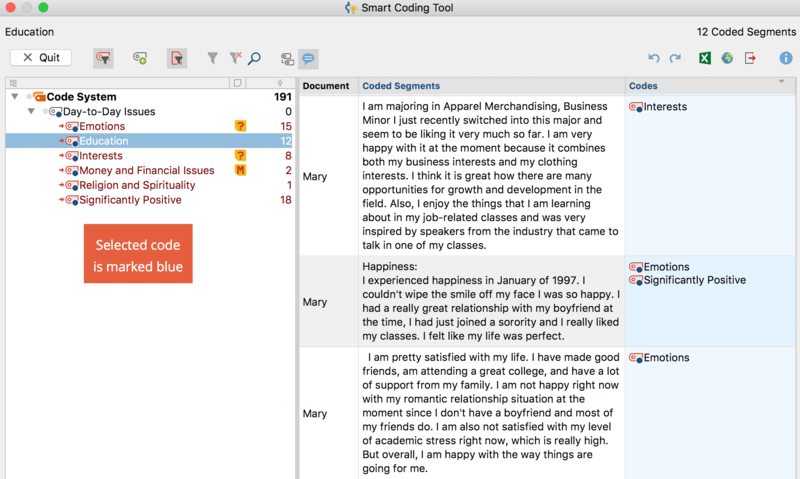 This option is selected automatically when you open the Smart Coding Tool. When turned off, all your codes and subcodes are displayed. New code – creates a new subcode in your code system. The new codes are always displayed at the bottom as the last subcode. Only activated documents – restricts the display of coded segments to those in currently activated documents. The display of frequencies in the code tree is adjusted accordingly. Reset all filters – removes all filters from all columns. Display comments – displays the “Comments“ column. Undo – undoes the last action in the Smart Coding Tool. Redo – redoes the last action in the Smart Coding Tool. In the dialog window that appears, enter your new code name and, if necessary, assign a code color. You can also enter a description of the new code in the “Code Memo” text box. Click on Add code if you want to add further codes. Click on OK to finish creating new codes. Tip: To create a new code at the top level, right-click on the root of the code hierarchy and select New code. Newly created codes are automatically activated so that these are displayed in the code system. Note: All changes to the code system using the Smart Coding Tool, including the creation of new codes, are added directly to your overall “Code System”. To assign a code to a coded segment, click and drag the line of the code to one of the displayed codes in the code system. The newly assigned code is then immediately displayed in “Codes” column. To code only part of a coded segment, first double-click on the whole coded segment text, then select the portion of text you want to code, and drag it to one of the codes in the code system. Even if you assign the same code to several sections of a coded segment’s text, the code name will only be listed once in the “Codes” column. If you hold down the ⇧ key (Windows) or cmd key (Mac) while dragging-and-dropping a whole line onto a code, the complete coded segment is moved to the selected code. It will thus no longer be displayed. Tip: By right-clicking on a row and selecting New code, you can add a code and assign it to the entire coded segment. To remove an assigned code, click the cross that appears when you move the mouse over a code in the “Codes” column. All assigned codes are then removed from the coded segment. Click a code in the code system to list all the segments coded with this code. This way you always have an overview of the contents of your individual categories. The selected code in the code system is highlighted blue. The name of the selected code is also displayed at the top of the window. Please note: The “Codes” column always shows only those code names which have been assigned in addition to the currently selected code. By default, if you drag a coded segment onto a code, that code will be assigned to the segment in addition to other previous codes assigned to it. The segment will still be coded with the code whose other segments are displayed in the right window. If you hold down the Shift key ⇧ (Windows) or cmd key (Mac), however, while dragging a coded segment to a code, the code will be replaced. That is, the code whose segments are currently listed in the right window is removed and the segment you dragged to a different code disappears from that list. This function is e.g. especially useful if you want to transfer a code from one subcode to another subcode, because it suits it better in terms of content. To move or copy all segments of a code to another code, right-click on a code and select the function Move Coded Segments or Copy Coded Segments in the context menu. Then right-click on the target code and select the corresponding function: Move Codded Segments from ‘Code xy’ or Copy Coded Segments from ‘Code xy’. For more information on this function, refer to the section Move or copy all coded segments of a code. In the comments column you can write a comment regarding each coded segment. The comments are stored as Coded Segment Comment for the code selected in the code system and highlighted in blue. In comments field, you can add comments about the coded segment texts, ideas for new categories, and more. They are also suitable for keeping track of your analytical procedure (i.e. “still unclear“ – “come back to this again later”) or for other team members (“please cross-check this!”). Double-click on a cell in the “Comments” column to enter a new comment or edit an existing one. Your current display can be exported via the usual icons at the top right of the window. All the rows (coded segments) in the right field are always exported.